An ongoing study is measuring the effect of drinking energy drinks on heart function using cardiac magnetic resonance imaging (MRI). Initial data shows that consuming these drinks significantly increase heart contraction rates after one hour. There has been ongoing debate on the health risks involved in consuming energy drinks; rapid heart rates being the major factor. Other known side effects associated with high consumption of these drinks are palpitations, rise in blood pressure and, in the most severe cases, seizures or sudden death. These drinks which primarily uses caffeine, sugar and taurine as its primary ingredient provide an energy boost to drinkers by providing mental and physical stimulation. 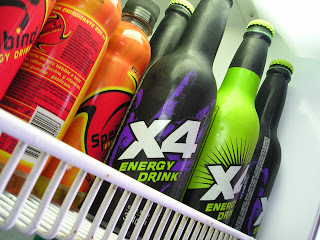 Compared to coffee and regular sodas, energy drinks contain up to three times more caffeine. Long term risks of drinking energy drinks are still unknown but study team member, Jonas Dörner, M.D, advises that people with known cardiac arrhythmias (irregular heartbeat) should avoid energy drinks. "Until now, we haven't known exactly what effect these energy drinks have on the function of the heart," said radiology resident Jonas Dörner, M.D., of the cardiovascular imaging section at the University of Bonn, Germany, which is led by the study's principal investigator, Daniel K. Thomas, M.D. "There are concerns about the products' potential adverse side effects on heart function, especially in adolescents and young adults, but there is little or no regulation of energy drink sales." "Usually energy drinks contain taurine and caffeine as their main pharmacological ingredients," Dr. Dörner said. "The amount of caffeine is up to three times higher than in other caffeinated beverages like coffee or cola. There are many side effects known to be associated with a high intake of caffeine, including rapid heart rate, palpitations, rise in blood pressure and, in the most severe cases, seizures or sudden death." Compared to the baseline images, results of cardiac MRI performed one hour after the study participants consumed the energy drink revealed significantly increased peak strain and peak systolic strain rates (measurements for contractility) in the left ventricle of the heart. The heart's left ventricle receives oxygenated blood from the lungs and pumps it to the aorta, which distributes it throughout the rest of the body. "We don't know exactly how or if this greater contractility of the heart impacts daily activities or athletic performance," Dr. Dörner said. "We need additional studies to understand this mechanism and to determine how long the effect of the energy drink lasts." The researchers found no significant differences in heart rate, blood pressure or the amount of blood ejected from the left ventricle of the heart between the volunteers' baseline and second MRI exams. "We've shown that energy drink consumption has a short-term impact on cardiac contractility," Dr. Dörner said. "Further studies are needed to evaluate the impact of long-term energy drink consumption and the effect of such drinks on individuals with heart disease."